Upon assuming power in 1959, Fidel Castro’s revolutionary government began to implement an aggressive national reforestation program. In large measure this program responded to a grave national concern given the country’s deforestation trend, but also dovetailed with populist policy objectives to improve rural socioeconomic and employment prospects, particularly in mountainous regions, as well as with national development priorities outlined by Castro as early as 1953 (Castro 1972, p. 190). In the short term, reforestation programs offered a viable, relatively low-cost, option to generate employment among those segments of the rural population that had harbored the revolutionaries during the armed struggle (e.g., the peasantry in the mountainous areas of Eastern Cuba). The reforestation strategy adopted by Castro’s government had been banded about in Cuba for years, with selected elements of the strategy beginning to be implemented in the earlyto mid-1950s. Several technical foreign missions sent to Cuba had advocated such an approach to arrest centuries of abuse of the country’s natural resource base, begin to reverse serious erosion problems, and curtail the country’s extreme dependency on lumber imports (Foreign Policy Association 1935; The World Bank 1951; FAO as cited by Reed 1992, p. 37). From the time of discovery to 1959, the total amount of land area forested in Cuba had declined from 72 percent (Marrero 1950, pp.107 and 195; Bucek 1986, p. 15) to 14 percent (COMARNA 1992, p. 1992, p. 30). As a result of the reforestation program initiated in 1959, by 1992, according to official estimates, the amount of land area forested had increased to 18.2 percent of the national territory. 2 This 30 percent increase was achieved partly through better management of timber harvesting rates but principally through reforestation (Westoby, 1989, p. 132). Of the total area forested in 1992, natural forests accounted for 84 percent, or two million hectares. Two-thirds (67.6 percent) of national forests were set aside as protected areas, while one-third (32.4 percent) was used for timber production. Between 1959 and 1992, the net annual addition in forested land area approached 14,000 hectares. These gains, particularly considering the experience of other Caribbean and Central American countries, are commendable, Cuba being the only country in the region that reversed secular deforestation trends. In eight Caribbean and Central American countries studied by the World Bank, the forest cover declined between 10 and 24 percent in the period 1981 to 1990 (Current, Lutz, and Scherr 1995, p. 152). However, in only two of these countries— El Salvador (6.2 percent) and Haiti (1.3 percent)— were forests less prevalent than in Cuba. By comparison, Costa Rica (28.8 percent), the Dominican Republic (22.5 percent), Guatemala (39.3 percent), Honduras (41.2 percent), Nicaragua (50.8 percent), and Panama (41.1 percent) had much higher forest covers. Although the overall reforestation trend in Cuba since 1959 has been broadly documented, no systematic attempt has been made to evaluate the relative success or difficulties associated with the implementation of the reforestation policies. In doing so, I rely on a broad definition of forestry that includes initiatives to preserve natural forests and restore formerly forested areas, inclusive of national parks, nature preserves, and tree plantations (for commercial purposes). My forestry paradigm also includes agroforestry practices and selected environmental issues related to mangrove areas. Impetus for the new government’s forestry program was provided by the Ley de Repoblación Forestal (Reforestation Law) of April 10, 1959. Article 10 created nine new national parks (in addition to the Sierra Cristal National Park), namely Cuchillas de Toa, Gran Piedra, Sierra Maestra, Escambray, Laguna del Tesoro, Los Organos, Guanacahabibes, Ciénaga de Lanier, and Sierra de Cubitas (Núñez Jiménez 1972, pp. 356-357; see also Ministerio de Ciencia 1995, pp. 36-40). The Law specified that the national parks individually should not have an extension of less than 500 caballerías (6,700 hectares). With domestic tourism in mind, the parks were to be made accessible to the public and be provided with hotel accommodations, including utilities. The localization of these national parks was in part dictated by the distribution of remaining forests, which in itself was a function of state land holding patterns prior to 1959. In pre-revolutionary days, the Cuban state claimed ownership to 37,000 caballerías (or 495,800 hectares) of forests, 42 percent of which where located in the Easternmost province of Oriente. In 1930, in the Sierra Cristal National Park, in the Baracoa region, a 2,000-caballería (or 26,800 hectares) forest preserve had been established to protect the local flora and fauna, prohibiting hunting and logging (Marrero 1950, p. 309). Municipal forestry parks were also called for by the 1959 reforestation law. These were to be created with support from the national forestry authorities. Antonio Núñez Jiménez, an influential voice in the conceptualization of the revolutionary government’s forestry and ecological initiatives, revived the notion of replanting forests along the banks of the country’s major rivers (to a depth of 100 meters), the focus of legislation enacted in 1923 (Foreign Policy Association 1935, p. 466). Núñez Jiménez went further and proposed the development of a “Gran Barrera Forestal” (Great Forestry Barrier)— presumably running all along the spine of the island— to retain humidity, preserve water resources, address the problem of erosion, and moderate the country’s climate. Grandiose as it was, his proposal was sensitive to geographic and economic regional variations, and was premised on the use of approaches consistent with local circumstances (Núñez Jiménez 1972, pp. 358-359). The barrier was to consist of rapidly growing tree species (e.g., eucalyptus, teaks), combined with other species, including fruit trees. The Cuban National System of Protected Areas … [had] over 200 protected areas that cover 12 percent of the country. However, only 1-2 percent of the country is strictly protected and some reserves appear to be too small to effectively preserve the biota they contain. It is estimated that Cuba has about two million hectares of forests, of which 1.7 million hectares (85 percent) consist of natural forests and the remainder of forestry plantations. Of these forested lands, national parks cover 5.1 percent, wildlife conservation areas 24.3 percent, water-shed protection areas 17.0 percent, coastal protection areas 19.2 percent, production forests 32.7 percent, and other categories 2.7 percent. The post-1959 reforestation efforts were initiated in 1960 under the direction of the Instituto Nacional de Desarrollo y Aprovechamiento Forestal (National Institute for Forestry Development and Use, INDAF). 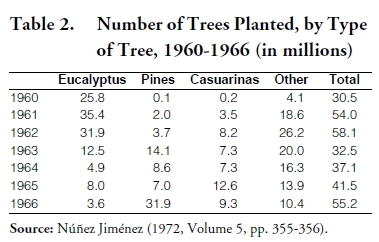 Between 1960 and 1966, as part of the Plan de Repoblación Forestal, 299 tree nurseries were established, and 348 million trees planted (Núñez Jiménez 1972, pp. 355-357). About one third of the trees planted were eucalyptus (122 million), followed by pines (68 million), casuarinas (48 million), and other species (109 million). Seedlings produced in fruit tree nurseries established in the country’s (then) six provinces were used to plant 1.6 million fruit trees between 1964 and 1965. 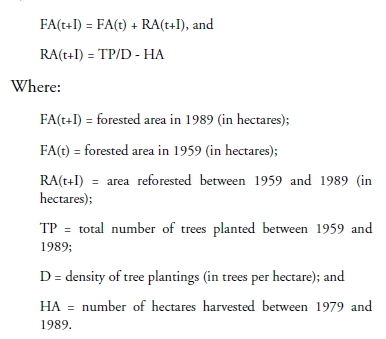 Table 1 presents data on number of trees planted between 1960 and 1989 in the state sector’s tree plantations. 3 In the late 1970s, the number of trees planted each year was roughly twice the number planted in 1960. Annual tree planting totals increased rapidly during the 1980s, exceeding over 100 million annually after 1982. Three times as many trees were planted in 1989 as in 1979. A number of observers have voiced special concern about the difficulties of reclaiming the open-pit nickel mining areas found in Eastern Cuba. Open pit mining completely removes the topsoil, thus leaving behind a “lunar landscape,” denuded of vegetation (Reed 1993, p. 32). By the late 1980s, after four decades of mining operations, 200 square kilometers of land (or 20,000 hectares) in the Moa-Nicaro area were totally degraded (Bucek 1986, p. 15). Reed (1993. p. 38), using a much lower estimate of amount of land degraded by open-pit mining, claims that by the early 1990s some 3,000 of 11,000 degraded hectares had been reclaimed. Note that the species distribution of trees planted changed appreciably over the years (see Tables 1 and 2), indicating an improvement in forestry policies. Whereas in 1960 (see Table 1), 92 percent (or 85 percent according to the data in Table 2) of all trees planted were eucalyptus (35 percent between 1960 and 1966), by 1989 eucalyptus accounted for only 3 percent of all seedlings. As Cuba’s cadre of professional foresters was trained and experience about Cuba’s natural conditions gained, more informed decisions appear to have been made about which species of trees to plant and where. By the early 1990s, Cuba had more than 1,000 forestry engineers and biologists, as well as close to 2,000 forestry technicians (Atienza Ambou et. al. 1992, p. 6). The early emphasis on planting eucalyptus trees was probably guided by ignorance and the Castro’s government tendency to make rushed and wasteful economic decisions, a characteristic not only found in forestry. In support of this interpretation, Westoby (1989, p. 132) notes that “much of the early [reforestation] effort was wasted as the result of elementary errors: seed of poor provenance, species ill-adapted to sites, over-emphasis on the number of trees planted and neglect of subsequent tending.” The focus on eucalyptus at the beginning of the reforestation program may have been dictated by the belief that reforestation with this rapidly-growing species would help arrest soil erosion, a widespread problem that was assigned the highest priority (Núñez Jiménez 1968). As noted by FAO (Poore and Fries 1985, pp. 21) most eucalyptus are not good trees for erosion control. When young, they are very susceptible to grass competition, and to obtain good growth, clean weeding is necessary during the establishment period, which is undesirable on steep or eroding terrain. Even mature stands may be ineffective in halting surface run-off. the Institute of Botany refused to work with the Forestry Institute on its plan for terracing mountainsides in Pinar del Río, planting monocultures of teak or hibiscus and clear-cutting of trees. They saw the plan as too vulnerable to pest problems and provoking massive erosion. The most outlandish example of poor decision-making, however, was a grandiose scheme to plant coffee trees in an agricultural belt around Havana (see below). The net gain in forested area is the difference between the land area forested in 1959 and the area in state forest enterprises in 1989 (inclusive of virgin and reclaimed forests), minus an estimate of the forested area harvested between 1979 and 1989. By assuming two different forestry plantation densities of 1,500 and 2,000 trees per hectare, 6 relating these densities to the 2.5 billion trees COMARNA claims have been planted in Cuba, and accounting for the forest area harvested between 1979 and 1989, the reforestation program’s success can be calculated as ranging between 27 and 53 percent. In other words, 27 to 53 percent of trees planted survived to maturity, tree mortality rates being in the order of 47 to 73 percent. 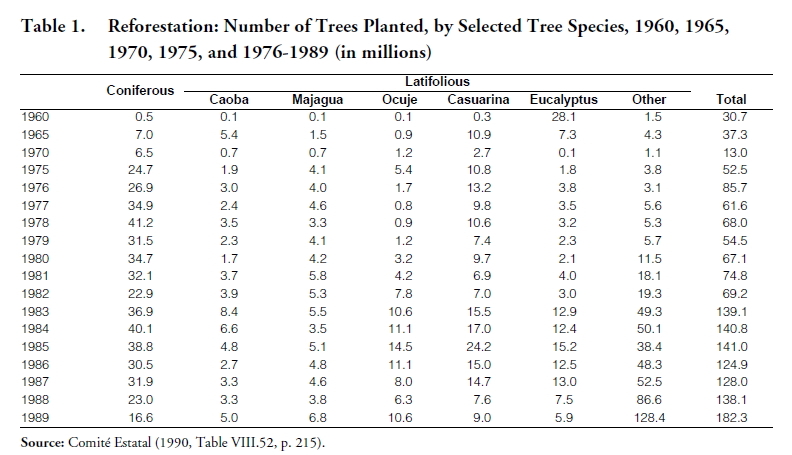 Both estimates are considerably higher that the only official tree mortality estimate of 40 percent we have been able to identify in the Cuban literature (Gómez 1979, p. 5). Mortality rates of this magnitude are not out of line with international experience, especially in situations where seedling care and early weeding practices are not given the required attention. 7 For a reforestation project to succeed, effective weeding is essential. During the first two to three years of a project, as many as three to four weedings a year are necessary (Committee on Selected 1982, p. 143). That proper seedling care procedures were not followed in Cuba, at least during the initial years of the reforestation program, is consistent with Westoby’s observations (cited above) and with what is generally known about the poor follow-up associated with many of Cuba’s agricultural practices. These estimates suggest that Cuba’s forestry accomplishments have been achieved at a very high economic cost. A balanced assessment of the accomplishments of the reforestation program must evaluate the adverse impact the socialist rural development model implemented since the early 1960s had on the 1959 tree stock. This model was largely premised on the establishment of large scale state farms and agricultural cooperatives. There are ample reasons to believe (see Dumont 1970a and 1970b) that large scale Sovietstyle farming led to the destruction of countless trees. A well-known French rural development expert, Dumont described what happened as brutal “because not even a tree that could provide shade or serve other purposes was left” (as cited by Nelson 1972, p. 94). Land clearing on a vast scale was underway in the 1960s as the government embraced an agricultural development approach based on several pillars, including widespread mechanization, collectivization, and extensive use of land. To ease the mechanization of vast tracts of land, small stands of mature and productive trees were obliterated. Trees were uprooted to permit heavy tractors and combines to operate unobstructed. 8 Also contributing to the destruction of localized tree stands was the consolidation of small farms into agricultural cooperatives. In pre-revolutionary days, Cuban peasants relied on traditional agroforestry practices (Current, Lutz, and Scherr 1995, pp. 153-154), planting trees–for fruit, shade, fencing, wood, cooking fuel and other purposes–for domestic consumption and as cash crops. Fewer and fewer tree groves were left standing, collectivization policies led to the consolidation of small farms into state farms and cooperatives, peasants were relocated to planned urbanized communities, and large scale mechanization was introduced. The land clearing tasks were assigned to mechanized military brigades, the notorious “Che Guevara columns.” The modus operandi of these brigades was to drag a chain between two tractors or army tanks, pulling along the way any vegetation they encountered, be they brushes, marabú, or small and large trees. Thirty-six such units were operating throughout the country in December 1969, each equipped with twenty pieces of heavy equipment and manned by 117 men (Nelson 1972, pp. 94-95). One astonishing result of this policy was to nearly obliterate palm trees, Cuba’s national symbol, from much of the national countryside, leading some observers to note that in the 1990s “most state farms are devoid of palm trees” (Deere, Pérez, and Gonzalez 1994, p. 225). These same observers note that lack of shade trees is interfering with the implementation of the Voisin grazing system (p. 215). This system is based on feeding a herd primarily in pastures which are fertilized with the cattle’s own manure. Pasture productivity is maintained by periodically rotating the herd from one small enclosure to the next through the use of shifting movable electrified fences. Supplementary feeding, transportable water sources, and a relative abundance of strategically distributed shade trees are essential components of the Voisin grazing system. Many shade trees currently lacking fell victim to the Che Guevara Brigades in the 1960s. Florida, between 1990 and 1993 the land area planted in citrus trees declined by 16,997 hectares, as plantations in the more marginal areas were left to wither or removed (Spreen et. al. 1996, p. 20). To partially compensate for the destruction of traditional fruit tree groves because of the expansion of sugar production, and as part of the country’s development strategy, the government embarked on a program to develop fruit tree, coffee and cacao plantations. Resources were assigned to develop mango and guava tree groves, as well as to expand coffee and cacao plantations in mountain areas, often as part of agroforestry projects. In some cases, ill-advised attempts were made to develop coffee plantations in regions poorly suited for this permanent tree crop. Best known was the directive during the 1970s to develop a “green belt” of coffee plantations in the lowlands surrounding the city of La Habana. This project was eventually abandoned, the coffee trees never having borne fruit. The waste of economic resources on this project alone was colossal. The performance of planting efforts of fruit bearing trees can be partially judged by analyzing the data in Table 3. The table provides statistics on the number of hectares planted with four fruit trees (mango, guava, coffee, and cacao) for 1970 and 1975, and for 1978 to 1989. Increases in the number of hectares planted with mangoes and guavas during the late 1970s and 1980s can almost definitely be attributed to efforts to reverse the damage done to fruit tree stands during the 1960s. An important characteristic, likely to differ from pre-revolutionary patterns, is that most mango and guava trees were planted in large stands, as opposed to small scale groves, as suggested by differential growth patterns between the state and private sectors. This pattern is consistent with the socialist model of organizing agricultural production on a large scale, in part to facilitate the use of chemical inputs and mechanization in agriculture. Particularly telling are the major fluctuations observed from year to year in number of hectares planted in the state sector. Fluctuations of this magnitude suggest poor planting practices or shifting agricultural priorities. In any event, they are indicative of a vast waste of resources and may also explain (together with exports) the persistent fruit shortages reported in Cuba. The environmental underpinnings of these trends, if any, as well as their consequences, remain to be analyzed. The trend for coffee is consistent with the gradual depopulation of Cuba’s mountain regions (up to the early 1990s) and with the failed attempts to expand coffee production into poorly suited areas close to major urban centers. The area planted with coffee peaked in 1979, gradually diminishing through 1989; the decline amounted to 25 percent over this period. The decline is especially noticeable in the private farming sector, although in 1989 over half of coffee production remained in private hands. Rural flight to urbanized localities is likely to be implicated in the decline of coffee plantations. Former coffee areas were the target of reforestation, given that coffee has traditionally been planted in association with other trees that provide shade and protection to coffee plants and also contribute to soil improvements. The declining trend is certain to have been reversed in the 1990s during the Special Period with the push to increase agricultural production in the mountains as part of the food self-sufficiency program. Cacao plantings remained relatively constant over the 19701989 period, except that the share of these plantations in the state sector increased. Cacao plants often are also found in close association with larger trees. Also harshly criticized by Rene Dumont were projects begun during the 1960s to restructure pastures in livestock farms according to inflexible geometrical designs. To achieve these designs, it was necessary to remove extensive living tree fences (live fenceposts) and, in many instances, trees planted along river banks (Dumont 1970a, pp. 123-127). Some of these trees could well have been planted decades earlier as part of erosion control projects. The number of trees that were destroyed is unknown, but it was probably in the millions. Although the evidence is only partial, there is reason to conclude that development projects carried out in several of Cuba’s mangrove regions also had a detrimental impact on the natural vegetation, trees included. Perhaps the more damaging were projects to increase the agricultural and tourism potential of the Zapata Swamp in South Central Cuba. FAO (1994, p.84) has called attention to the adverse ecological consequences of road construction and other human activities in mangrove areas, an observation also made by Borhidi (1991, p. 453) in connection with the Zapata swamp in his exhaustive study of Cuba’s vegetation ecology. Included here are environmentally damaging agricultural activities— such as inappropriate drainage, pollution, grazing, and use of marginal areas— as well as activities related to the production of charcoal and the extraction of peat. The unfavorable effects of these practices are corroborated by data reviewed immediately below. A 1995 World Bank/World Wildlife Fund (Diner-stein et. al. 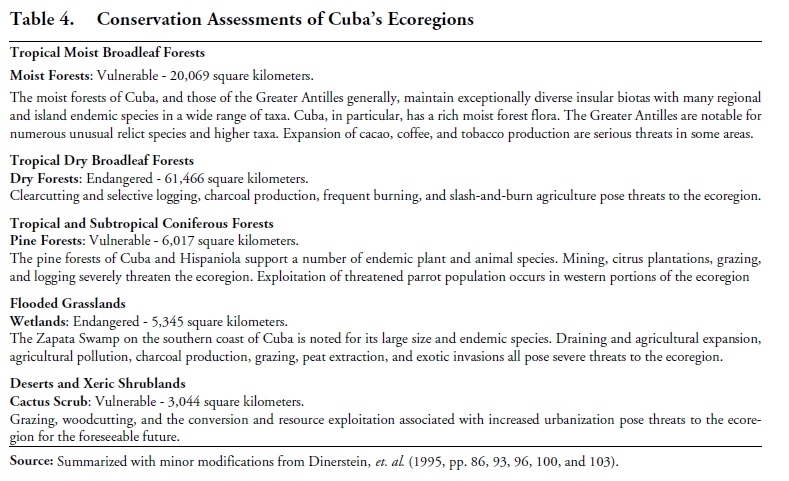 1995) conservation assessment of the major ecoregions of Latin America and the Caribbean provides an overview of the conservation status of some of Cuba’s natural ecoregions, identifying their degree of vulnerability and protection needs. The study is particularly revealing since it provides an independent evaluation of the status of Cuba’s natural regions within a regional comparative framework. An ecoregion is defined as a “geographically distinct assemblage of natural communities that (a) share a large majority of their species and ecological dynamics; (b) share similar environmental conditions; and (c) interact ecologically in ways that are critical for their long-term persistence” (p. 124). According to these criteria (see Table 4), of the five ecoregions into which Cuba is divided, two, the tropical broadleaf dry forests (formerly extending across much of Cuba) and the flooded wetlands (the Zapata swamps) were considered to be endangered, while three, the moist broadleaf forests (found in the country’s highest altitudes), the coniferous pine forests (Pinar del Río and Isla de la Juventud in the West), and the cactus scrub (in the Southeast) are considered to be vulnerable. The endangered and vulnerable classifications are intermediate between the classifications of extinct (or completely converted from natural habitat) and critical, on the one hand, and relatively stable or relatively intact, on the other (p. xvi). The study’s of taxonomy is based on five indicators (total loss of original habitat; number and size of blocks of original habitat; rate of habitat conversion; degree of fragmentation or degradation; and degree of protection) of landscape integrity related to the maintenance of ecological processes and biological diversity. Most protected at the present time are the broad leaf moist forest (probably because they are the ecoregions of more difficult access), and least are the broad leaf dry forests, pine forests, and cactus scrub. But even in the most protected areas, human activities, including mining and logging operations, as well as the presence of permanent plantations (e.g., coffee, citrus), are having adverse ecological impacts. In relative conservation terms, Cuba is not doing significantly better or worse than other neighboring nations. Nevertheless, the Cuban forests continue to be threatened by human activities, in particular by excessive logging, the expansion of agroforestry activities, and by slash and burn agriculture. The latter is surprising since slash and burn agriculture is usually associated with landless peasants seeking farm land, a problem not expected in a country where most land is government owned. Not mentioned by the study is that these threats have intensified in recent years as a result of the food selfsufficiency policies being pursued by the Cuban government during the “Special Period,” most of all by the drive to increase food production in mountainous areas and more intensively harvest forests to produce domestic fuel and charcoal. Of note in these regards are the widely publicized Turquino and Manatí plans, whereby attempts are underway to relocate farmers to mountain regions by giving them private plots of land to increase production of several commodities (e.g., coffee and honey) and engage in forestry activities (e.g., reforestation of denuded areas and reclamation of areas affected by mining activities) (Gersper et. al. 1993, p. 22). These plans were conceived in part to address low agricultural production levels in these areas, their success being predicated on expanding the labor supply, introducing seldom used technologies, developing new types of farming arrangements, and granting farmers access to individual plots of land (Cuban Commission 1996, pp. 11-12). Increased human interventions in these areas, some with only limited agricultural potential, are playing havoc with preservation and reforestation efforts, despite difficulties with plan implementation and the avowed preservation intent of the mountain development initiatives (Ministerio de Ciencia 1995, pp. 3841). Preservation and development objectives are clearly contradictory. In the Escambray mountains of Central Cuba, for example, targets have not been met due to poor road conditions, water quality, and other factors (“Cuban Official” 1996, pp. 4-5). The nature of the threats varies depending on the ecoregions in question. They are less severe in the more inaccessible mountain regions, but even here they are so in selected areas (see Table 4). Ecological concern has also been raised by the rush to develop tourism poles, including ecotourism, to earn badly needed foreign exchange (Dewar 1993, p. 6A). The findings of the World Bank/World Wildlife Fund study clash with the nearly idyllic description of conservation and reclamation policies portrayed in official Cuban government documents. Official interpretations are also at variance with the perspective provided by an FAO document with respect to the National Forestry Action Plan elaborated by Cuba in the early 1990s. The findings of this document are reviewed below. strengthening of research and training institutions. The NFAP may in part be seen as a response to the economic crisis engulfing Cuba since 1990. Cuba used to import much of its lumber from the Soviet Union. During the 1980s, the Soviet Union had a shortage of lumberjacks and therefore lumber shipments to Cuba were irregular. To address this problem, in December 1986 Cuba and the Soviet Union created a joint enterprise to exploit Soviet Far Eastern timber resources for export to different countries, including Cuba. As many as 400 Cuban lumberjacks were assigned to these activities (Pérez-López and Díaz-Briquets 1990, pp. 287-288). How this venture ended has not been documented, but we assume that it concluded with the collapse of the Soviet Union, if not before. Greater reliance on, and better management of, national forests could mitigate supply shortfalls and abate the over-exploitation of forest resources during the Special Period. There is mounting evidence that forestry conservation efforts have experienced a setback as lumbering rates in the 1990s increased in response to the end of wood and fuel shipments from the former Soviet Union. Shortages of home cooking fuels have been partly compensated by increasing supplies of domestically produced charcoal and fuelwood. Government officials (“Officials Urge Measures” 1994, p. 3) have “sharply criticized the indiscriminate chopping down of trees and theft and misappropriation of the wood,” as the unavailability of fuels and other supplies leads to unregulated use of forests products. Attempts to increasingly rely on forest products to attain self-sufficiency extends to the planting of “power forests,” or stands of rapidly growing trees to produce charcoal. A 1994 report indicates that this program has run into problems: the locations in which planting goals have been met are too far from where charcoal supplies are needed (“Roundup of Economic Developments” 1994, p. 9). There is also concern about intensified logging pressures on regions that have traditionally served as charcoal sources (National Public Radio 1995). Further, tourism construction projects are likely to have sustained (or even increased) demand for domestic lumber, despite a cutback in housing construction, and the end of wood imports from the former Soviet Union. As a result of these developments and the apparent lack of reforestation inputs, efforts to further increase forested areas are faltering (“Effects of U.S. Blockade” 1995, p. 8), not only due to higher harvesting rates, but also because reforestation rates have declined. In 1992, for example, only 500,000 seedlings were planted although the target was to plant four million trees (“Roundup of Economic Activity” 1992, p. 3). Given Cuba’s current economic crisis, we can foresee increasing pressures on Cuba’s natural resource base, including its forests, as a consequence of the policies being followed as part of the Special Period. It is apparent that some of the gains of the last four decades are being reversed under pressure from economic events. Some of these policies emanate from the national drive to attain food self-sufficiency and others from the economic difficulties associated with the curtailment of the ability to import. The policy to encourage urban residents to resettle in coffee-growing mountain regions, for example, adds environmental pressures to heretofore relatively undisturbed areas. Even primitive subsistence agricultural activities will continue to damage the forests as peasant families push further into the country’s forested areas. The same is true regarding charcoal production, a pursuit that has received renewed emphasis given the national shortage of commercial home-cooking fuels. The housing shortage and the boom in the tourism industry are also of major concern: in the absence of imports, domestic lumber must be used for construction projects. Dearth of inputs, finally, must also be having a deleterious impact on reforestation efforts as even the import of the most basic reforestation inputs has been curtailed. Atienza Ambou, Aida, Anicia García Alvarez, and Oscar U. Echevarría Vallejo 1992. ”Repercusiones medioambientales de las tendencias de desarrollo socioeconomico en Cuba,” mimeo. La Habana: Instituto Nacional de Investigaciones Económicas. Borhidi, A. 1991. Phytogeography and Vegetation Ecology of Cuba. Budapest, Hungary. Akademia Kiado. Bucek, Antonio 1986. “Aseguramiento territorial de la estabilidad ecológica y sus condiciones en Cuba.” In Instituto de Geografía, Unidad HombreNaturaleza. La Habana. Editora de la Academia de Ciencias de Cuba, pp. 9-24. Castro, Fidel 1972. “History Will Absolve Me” (October 16, 1953). In Rolando E. Bonachea and Nelson P. Valdes, Editors, Revolutionary Struggle: The Selected Works of Fidel Castro. Cambridge, Massachusetts. The MIT Press, pp. 164221. COMARNA (Comisión Nacional de Protección del Medio Ambiente y el Uso Racional de los Recursos Naturales) 1992. Informe nacional a la conferencia de Naciones Unidas sobre medio ambiente y desarrollo Brasil/1992. Resumen. La Habana. Comité Estatal de Estadísticas 1990. Anuario Estadístico de Cuba 1989. La Habana. Committee on Selected Biological Problems in the Humid Tropics 1982. Ecological Aspects of Development in the Humid Tropics. Washington, D.C. National Academy Press. “Cuban Commission Views Valley, Mountain Municipalities” 1996. FBIS-LAT-96-024 (5 February), pp. 11-12. “Cuban Official on Turquino-Manatí Plan Implementation” 1996. FBIS-LAT-96-023 (2 February), p. 4. Current, Dean, Ernst Lutz, and Sara J. Scherr 1995. “The Costs and Benefits of Agroforestry to Farmers.” The World Bank Research Observer 10:2 (August), pp. 151-180. Deere, Carmen Diana, Niurka Pérez and Ernel González. 1994. “The View from Below: Cuban Agriculture in the ’Special Period in Peacetime.’” The Journal of Peasant Studies 21:2, pp. 194-234. Dewar, Heather 1993. “Unlocking the Mysteries of Cuba’s Rare Wildlife.” The Miami Herald (26 October), pp.1A, 6A, and 12A. Dinerstein, Eric, David M. Olson, Douglas J. Graham, Avis L.Webster, Steven A. Primm, Marnie P. Bookbinder, and George Ledec 1995. A Conservation Assessment of the Terrestrial Ecoregions of Latin America and the Caribbean. Washington, D.C.: The World Bank and the World Wildlife Fund. Dumont, Rene 1970a. Cuba ¿Es socialista? Caracas: Editorial Tiempo Nuevo. Dumont, Rene 1970b. Cuba: Socialism and Development. New York: Grove Press. “Effects of U.S. Blockade on Environment Noted.” 1995. FBIS-LAT-95-186 (26 September), p. 8. FAO 1993. Tropical Forests Action Programme Update. Rome: Food andAgriculture Organization. FAO 1994. Mangrove Forest Management Guidelines. FAO Forestry Paper No. 117. Rome: Food and Agriculture Organization. Foreign Policy Association 1935. Problems of the New Cuba. New York. Gersper, Paul L., Carmen S. Rodríguez-Barbosa, and Laura F. Orlando 1993. “Soil Conservation in Cuba: A Key to the New Model for Agriculture.” Agriculture and Human Values X:3, pp. 16-23. Gomez, Orlando 1979. “Esos verdes pulmones de Cuba se multiplicaron muchas veces.” Granma (June 23), p. 5. Gregerse, H.M. et. al. 1995. “Valuing Forests: Context, Issues and Guidelines.” FAO Forestry Paper 127. Rome: Food and Agriculture Organization. Grupo Cubano de Investigaciones Económicas. 1963. Un estudio sobre Cuba. Miami, Florida: University of Miami Press. Knox, Paul 1995. “Sherritt Breathes Life Into Cuban Mine.” The Globe and Mail (Toronto)(31 July). Levins, Richard 1993. “The Ecological Transformation of Cuba.” Agriculture and Human Values X:3, pp. 52-60. Marrero, Leví 1950. Geografía de Cuba. La Habana: La Moderna Poesía. Memorias Inéditas del Censo de 1931. 1978. La Habana: Editorial de Ciencias Sociales. Ministerio de Ciencia, Tecnología y Medio Ambiente. 1995. Cuba: Medio Ambiente y Desarrollo. La Habana. Moreno Fraginals, Manuel 1964. El Ingenio: El complejo económico y social cubano del azúcar. La Habana. National Public Radio 1995. “Cuba Struggles to Save Economy and Ecology.” Transcript of “All Things Considered” Radio Program. Washington, D.C.: National Public Radio (30 May). Nelson, Lowry 1972. Cuba: The Measure of a Revolution. Minneapolis: University of Minnesota Press. Núñez Jiménez, Antonio 1968. La erosión desgasta a Cuba. La Habana: Instituto del Libro. “Official Urges Measures to End Deforestation” 1994. FBIS-LAT-94-066 (6 April), p. 3. Pagés, Raisa 1981. “Una riqueza natural que debemos preservar.” Granma (27 February), p. 4. Pérez-López, Jorge and Sergio Díaz-Briquets 1990. “Labor Migration and Offshore Assembly in the Socialist World: The Cuban Experience.” Population and Development Review 15:2, pp. 273299. Pichs, Ramón 1992. “Cuba ante los desafios ambientales globales.” La Habana. Unpublished. Poore, M.E.D. and C. Fries 1985. “The Ecological Effects of Eucalyptus.” FAO Forestry Papers No. 59. Rome: Food and Agricultural Organization. Prado, José Antonio 1996. “Kindling.” The Economist (March 16-22), p. 8. Preeg, Ernest H. 1996. The Haitian Dilemma. Washington, D.C.: The Center for Strategic and International Studies. Reed, Gail 1992. “On the Razor’s Edge: Deforestation in Cuba.” Cuba Update Nos. 1-2 (September), pp. 36-38. Reed, Gail 1993. “Protecting the Environment in the ’Special Period.’” Cuba Update Nos. 1-2 (September), pp. 29, 31-32. República de Cuba 1988. Protección del medio ambiente y uso racional de los recursos naturales. La Habana. “Roundup of Economic Activity Reported 23-28 Dec.” 1992. FBIS-LAT-92-252 (31 December), pp. 2-3. “Roundup of Economic Developments.” 1994. FBIS-LAT-94-109 (7 June), pp. 8-9. Santana, Eduardo 1991. “Nature Conservation and Sustainable Development in Cuba.” Conservation Biology 5:1, pp. 13-15. Spreen, Thomas H., Armando Nova González, and Ronald P. Murato 1996. The Citrus Industries in Cuba and Florida. International Working Paper Series, IW96-2, International Agricultural Trade and Development Center. Gainesville: University of Florida. “Surgen los bosques” 1983. Prisma Latinoamericano (September), p. 26. Thomas, Hugh 1971. Cuba: The Pursuit of Freedom. New York: Harper & Row Publishers. War Department 1900. Report on the Census of Cuba 1899. Washington, D.C.: U.S. Government Printing Office. Westoby, Jack 1989. Introduction to World Forestry. London. Basil Blackwell. The World Bank 1951. Report on Cuba. Washington, D.C. The World Bank 1992. “Development and the Environment.” World Development Report. Washington, D.C.